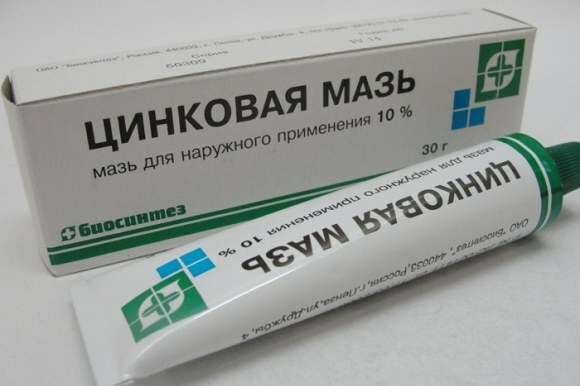 Zinc ointment — antiseptic anti-inflammatory agent. The drug consists of active component zinc oxide and excipients vaseline. The drug is used topically, it has a drying and astringent. The basic amount of zinc in the human body have on the skin. Therefore, zinc is a required component of most medicinal drugs and cosmetic products. Petrolatum, present in the cream restores the hydrolipidic layer, moisturizes the skin and allows the skin to peel and crack. Also, vaseline does not penetrate deep into the tissue, thereby not getting in the blood stream. Simple ointment helps to combat acne and severe forms of skin ailments. Zinc blend effectively cope with difficult bacterial diseases of the skin. The drug is included in the complex therapy for almost all diseases of the epidermis. Ointment applied 3-4 times a day. Previously, the affected area is treated with antiseptic solution, then the drug is applied in a thin layer using a circular motion. If the tool is used in the fight against prawym rash, it is applied pointwise. It should be noted that acne treatment will have no effect if the cause of the disease lies in the internal organs. Zinc ointment has no side effects and contraindications. It is so safe that it is used for diaper rash in infants. Problems such as diaper rash, pimples on the buttocks and the sweat disappear on the second or third day of drug administration. Also during therapy with zinc drug doctors recommend a diet. It is necessary for the period of treatment to give up foods containing copper: cocoa, chocolate, pork liver, hazelnut etc. They tend to bind and completely neutralize the zinc. You must consume beans, sea fish, green vegetables, tomatoes, milk, etc. these products contain large amount of zinc. Zinc ointment is contraindicated only in case of hypersensitivity to the drug components. Also the drug is not used as a Foundation makeup. Zinc has the property to form new chemical compounds that lead to severe allergic reactions and skin diseases. The advantage of the drug is its price. Depending on the regions it varies from 15 to 40 roubles. Patients respond positively to the drug. It is effective in complex therapy against diseases such as acne, bedsores, eczema, dermatitis and herpes simplex. Also ointment have proved effective against chemical, thermal and solar burns. People use the drug against scratches and cuts.